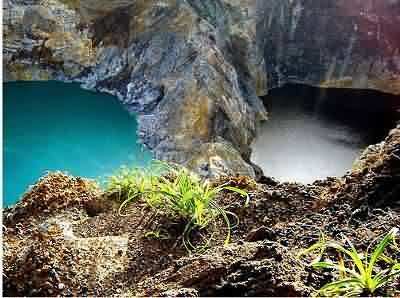 Multi-colored crater lakes of Kelimutu are a beautiful and mysterious geological anomaly. Although they share the crest of the same volcano and are practically side-by-side, the lakes periodically change colors independently of each other. 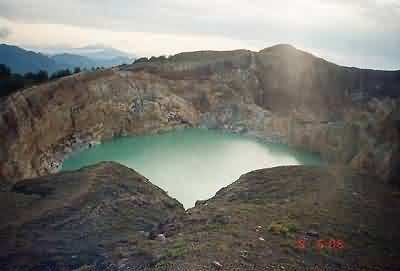 The volcanic lakes appear to be boiling as gases continue to escape from the volcano below. Fumarole activity below the surface causes the colors to range from red and brown to turquoise and green. The Kelimutu lakes are one of the most popular attractions in Nusa Tenggara and were once featured on the rupiah - the national currency of Indonesia. Local communities even believe that the lakes are home to ancestral spirits. Kelimutu is located in the center of Flores, Indonesia roughly 40 miles from the town of Ende and 52 miles from Maumere. Both Ende and Maumere have small airports with flights from major hubs in Indonesia, however service is unpredictable and tickets must be purchased at the airport. The drive from Maumere - the larger of the two towns - takes around three to four hours. The narrow road through Flores is mountainous and slow-going; most visitors choose to visit the lakes by staying in the tiny village of Moni. Crowded public buses run the road to Moni regularly or you can team with other travelers to hire a private car. Moni is only nine miles from the lakes and is the usual base for visiting Kelimutu, although some tour companies run buses all the way from Ende. Accommodation is limited in Moni and things fill up quickly in the peak months of July and August. Your guest house in Moni will arrange transportation to the summit. Expect to leave Moni around 4 a.m. in order to reach Kelimutu before sunrise. During the low season transportation may be as simple as riding on the back of a motorcycle! A heavy fog often obscures the lakes, so most tourists arrive at the summit to watch the sunrise. Mornings are cold and windy on the summit; wear warm clothes that can be removed as the day heats up later in the afternoon. The trail is well-marked, but bring a flashlight if you intend to hike before sunrise. There may be vendors offering coffee and tea on the trail, but take your own water and snacks. There is little shade around the lakes, wear a hat and protect yourself from the sun. Kelimutu National Park is home to several endangered plants and animals, always stay on marked trails to avoid further erosion of their fragile environment. Although there is an unofficial trail that traverses the rim of the lakes, walking around is not recommended. Loose shale and volcanic rock make parts of the steep path dangerous, and noxious fumes rising from the crater will literally take your breath away. A fall into the lakes would be fatal. Most people depart shortly after the sunrise, however the afternoon sun really brings out the brilliance of the colors on Kelimutu. You may even have the lakes to yourself during afternoons in the off season! Not all transportation arranged in Moni includes return. Many visitors choose to walk back to town by taking a steep and scenic shortcut down the mountain. The walk passes a waterfall and favorite swimming spot for locals. The trail begins near the entrance gate to Kelimutu, ask someone for directions. If you choose not to walk back to town, you may find other transportation options in the parking area or flag any public bus on the road back to Moni. The other-worldly colors and thick mist surrounding the volcano have earned Kelimutu a supernatural reputation. Local villages believe that the spirits of the dead go to rest in one of the lakes based upon the deeds performed on Earth. 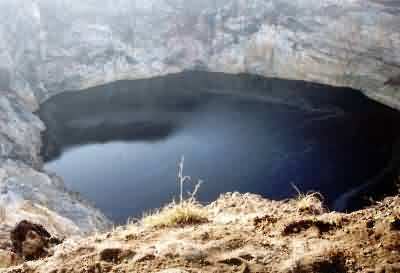 Tiwa Ata Mbupu, the solo lake on the west side of the summit, is believed to be where elders and wise people go. Tiwu nua muri koo fai is the lake where young people go when they die. Iwu ata polo is the cursed home of evil spirits. Moni is a tiny farming village, but several budget guest houses have popped up due to the proximity of Kelimutu. Moni is certainly not the place to linger if you wish to shop, dine luxuriously, or party, but there is a charm in the fresh air. Some of the neighboring villages produce beautiful traditional weavings and the once-weekly market day held in Moni is interesting to see.